^ Doig, Jameson W. (2001). “Chapter 1”. Empire on the Hudson. Columbia University Press. ISBN 0-231-07676-2. ^ a b c d e f Gillespie, Angus K. (1999). “Chapter 1”. Twin Towers: The Life of New York City's World Trade Center. Rutgers University Press. ISBN 0-7838-9785-5. ^ Lew, H.S. ; Richard W. Bukowski; Nicholas J. Carino (September 2005). Design, Construction, and Maintenance of Structural and Life Safety Systems (NCSTAR 1-1). National Institute of Standards and Technology. p. 7. ^ Lew, H.S. ; Richard W. Bukowski; Nicholas J. Carino (September 2005). Design, Construction, and Maintenance of Structural and Life Safety Systems (NCSTAR 1-1). National Institute of Standards and Technology. p. 9. ^ National Construction Safety Team (September 2005). “Chapter 1” (PDF). Final Report on the Collapse of the World Trade Center Towers. NIST. p. 1. http://wtc.nist.gov/NISTNCSTAR1CollapseofTowers.pdf. ^ Lew, H.S. ; Richard W. Bukowski; Nicholas J. Carino (September 2005). Design, Construction, and Maintenance of Structural and Life Safety Systems (NCSTAR 1-1). National Institute of Standards and Technology. p. xxxviii. ^ a b c d e Lew, H.S. ; Richard W. Bukowski; Nicholas J. Carino (September 2005). Design, Construction, and Maintenance of Structural and Life Safety Systems (NCSTAR 1-1). National Institute of Standards and Technology. p. 8. ^ National Construction Safety Team (September 2005). “Chapter 1” (PDF). Final Report on the Collapse of the World Trade Center Towers. NIST. pp. 5–6. http://wtc.nist.gov/NISTNCSTAR1CollapseofTowers.pdf. ^ Taylor, R. E. (1966年12月). 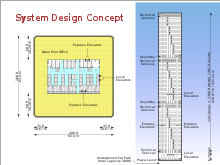 “Computers and the Design of the World Trade Center”. ASCE, Structural Division 92 (ST–6): 75–91. ^ a b c d e f g h National Construction Safety Team (September 2005) (PDF). Final Report on the Collapse of the World Trade Center Towers. NIST. http://wtc.nist.gov/NISTNCSTAR1CollapseofTowers.pdf. ^ Lew, H.S. ; Richard W. Bukowski; Nicholas J. Carino (September 2005). Design, Construction, and Maintenance of Structural and Life Safety Systems (NCSTAR 1-1). National Institute of Standards and Technology. p. 10. ^ a b American Iron and Steel Institute (1964年). “The World Trade Center – New York City”. Contemporary Steel Design (American Iron and Steel Institute) 1 (4). ^ National Construction Safety Team (September 2005) (PDF). Final Report on the Collapse of the World Trade Center Towers. NIST. p. 10. http://wtc.nist.gov/NISTNCSTAR1CollapseofTowers.pdf. ^ Tamaro, George J. (Spring 2002). “World Trade Center "Bathtub": From Genesis to Armageddon”. Bridges 32 (1). オリジナルのSeptember 30, 2007時点によるアーカイブ。. https://web.archive.org/web/20070930043409/http://www.nae.edu/nae/bridgecom.nsf/weblinks/CGOZ-58NLJ9?OpenDocument. ^ National Construction Safety Team (September 2005) (PDF). Final Report on the Collapse of the World Trade Center Towers. NIST. p. 8. http://wtc.nist.gov/NISTNCSTAR1CollapseofTowers.pdf. ^ Glanz, James; Eric Lipton (2003). City in the Sky. Times Books. p. 138. ISBN 0-8050-7428-7. ^ Glanz, James; Eric Lipton (2003). City in the Sky. Times Books. pp. 139–144. ISBN 0-8050-7428-7. ^ Glanz, James; Eric Lipton (2003). City in the Sky. Times Books. pp. 160–167. ISBN 0-8050-7428-7. ^ Lew, H.S. ; Richard W. Bukowski; Nicholas J. Carino (September 2005). Design, Construction, and Maintenance of Structural and Life Safety Systems (NCSTAR 1-1). National Institute of Standards and Technology. p. 153. ^ Lew, H.S. ; Richard W. Bukowski; Nicholas J. Carino (September 2005). Design, Construction, and Maintenance of Structural and Life Safety Systems (NCSTAR 1-1). National Institute of Standards and Technology. p. 162. ^ Lew, H.S. ; Richard W. Bukowski; Nicholas J. Carino (September 2005). Design, Construction, and Maintenance of Structural and Life Safety Systems (NCSTAR 1-1). National Institute of Standards and Technology. p. 163. ^ Evans, David D.; Richard D. Peacock, Erica D. Kuligowski; W. Stuart Dols; William L. Grosshandler (September 2005). Active Fire Protection Systems (NCSTAR 1–4). National Institute of Standards and Technology. p. 14. ^ Gillespie, Angus K. (1999). Twin Towers: The Life of New York City's World Trade Center. Rutgers University Press. p. 61. ISBN 0-7838-9785-5. ^ a b Gillespie, Angus K. (1999). Twin Towers: The Life of New York City's World Trade Center. Rutgers University Press. p. 68. ISBN 0-7838-9785-5. ^ Gillespie, Angus K. (1999). Twin Towers: The Life of New York City's World Trade Center. Rutgers University Press. p. 83. ISBN 0-7838-9785-5. ^ Gillespie, Angus K. (1999). Twin Towers: The Life of New York City's World Trade Center. Rutgers University Press. p. 88. ISBN 0-7838-9785-5. ^ Gillespie, Angus K. (1999). Twin Towers: The Life of New York City's World Trade Center. Rutgers University Press. pp. 92–94. ISBN 0-7838-9785-5. ^ Gillespie, Angus K. (1999). Twin Towers: The Life of New York City's World Trade Center. Rutgers University Press. p. 91. ISBN 0-7838-9785-5. ^ Lew, H.S. ; Richard W. Bukowski; Nicholas J. Carino (September 2005). Design, Construction, and Maintenance of Structural and Life Safety Systems (NCSTAR 1-1). National Institute of Standards and Technology. p. xxxvi. ^ a b c Gillespie, Angus K. (1999). Twin Towers: The Life of New York City's World Trade Center. Rutgers University Press. p. 71. ISBN 0-7838-9785-5. ^ Gillespie, Angus K. (1999). Twin Towers: The Life of New York City's World Trade Center. Rutgers University Press. p. 70. ISBN 0-7838-9785-5. ^ Gillespie, Angus K. (1999). Twin Towers: The Life of New York City's World Trade Center. Rutgers University Press. p. 69. ISBN 0-7838-9785-5. ^ McAllister, Therese; Johnathan Barnett; John Gross; Ronald Hamburger; Jon Magnusson (May 2002). 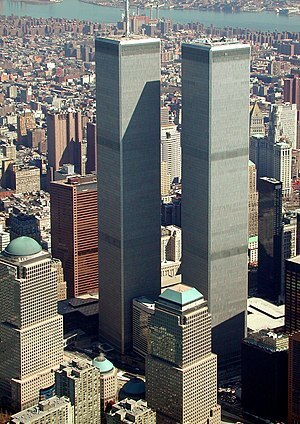 “WTC3”. World Trade Center Building Performance Study. FEMA. ^ McAllister, Therese; Johnathan Barnett; John Gross; Ronald Hamburger; Jon Magnusson (May 2002). “WTC4, 5, and 6”. World Trade Center Building Performance Study. FEMA. ^ McAllister, Therese; Johnathan Barnett; John Gross; Ronald Hamburger; Jon Magnusson (May 2002). “WTC7”. World Trade Center Building Performance Study. FEMA. ^ Lew, H.S. ; Richard W. Bukowski; Nicholas J. Carino (September 2005). Design, Construction, and Maintenance of Structural and Life Safety Systems (NCSTAR 1-1). National Institute of Standards and Technology. p. xliv. ^ Lew, H.S. ; Richard W. Bukowski; Nicholas J. Carino (September 2005). Design, Construction, and Maintenance of Structural and Life Safety Systems (NCSTAR 1-1). National Institute of Standards and Technology. p. xlv. ^ a b Ramabhushanam, Ennala; Marjorie Lynch (1994年). “Structural Assessment of Bomb Damage for World Trade Center”. Journal of Performance of Constructed Facilities 8 (4): 229–242. doi:10.1061/(ASCE)0887-3828(1994)8:4(229). ^ Evans, David D.; Richard D. Peacock, Erica D. Kuligowski; W. Stuart Dols, William L. Grosshandler (September 2005). Active Fire Protection Systems (NCSTAR 1–4). National Institute of Standards and Technology. p. 44.